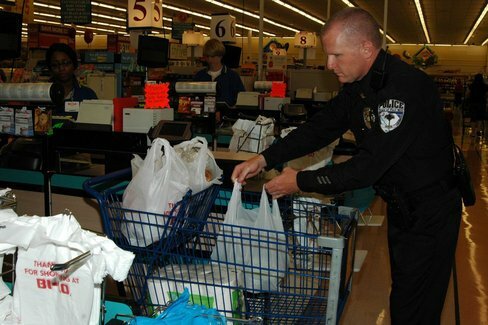 A Fort Mill police officer has a new part time gig: He bags groceries at Fort Mill’s Bi-Lo. He’s earning extra money, but it’s not for his vacation fund. This is just another aspect of serving our community said Lt Dixon. The tips he earns are donated to the Fort Mill Care Center. Dixon works about two hours a week bagging groceries for Bi-Lo customers. He will continue working as a bagger until early summer and will next work at the store from 4 to 6 p.m. March 29, April 4 and 12. A tip jar sits at each register for the community to help Dixon achieve the goal of collecting $3,000. The fundraiser started two months ago after a brainstorming effort led by Bi-Lo store director/manager Avery Price, who was considering how best to team up with the Fort Mill Police Department to help a local agency.